This week marks the release of Suikoden III in North America ten years ago. The game also came out in Japan at the same time and, infamously, never came out in PAL territories ostensibly due to quality control rules regarding localisation languages in Europe. Suikoden III is an interesting game in that it marks the end of a lot of things about the series. This was the last game that original scenario designer/all-round Suikoden creator Muryama Yoshitaka worked on, for starters. Muryama created Suikoden as a one-off game. Through a mixture of good timing and luck, the first Suikoden came out in a relative barren RPG landscape on the original PlayStation. That game did well enough to earn itself a sequel. Suikoden II, although set in the same world as the original game, three years in the future, functions as something more akin to a re-imagining of the original title. The (contextual) success of this title saw Suikoden become a bonafide franchise with three side games and a slightly dizzying array of merchandise and publications separating Suikoden II from its numerical successor. By this point, Muryama had some sort of idea about the greater plot of the series. Although each game deals with regional wars in a technologically stagnant world, the arcing plot was growing more to encompass the role of the 27 True Runes, the magical crests which governed every aspect of the world. Their role in the struggle between Order and Chaos, intersecting with questions of free will and destiny were commented on in the first two games but really came to the fore in Suikoden III. Despite the successes of the original batch of Suikoden games on the first Playstation, Konami had reservations about the direction of this overarching plot. The rumours persisted as to the reasoning, from simply busybody executives, to concerns that if the plot were to be wrapped up soon, then the reliable profit earner would be no more but in the end, the result is the same; Muryama Yoshitaka was to leave the team towards the end of Suikoden III’s development cycle. Suikoden III’s cartoon graphics allowed the game to maintain a bright and distinct visual style without proving too taxing or costly to make. 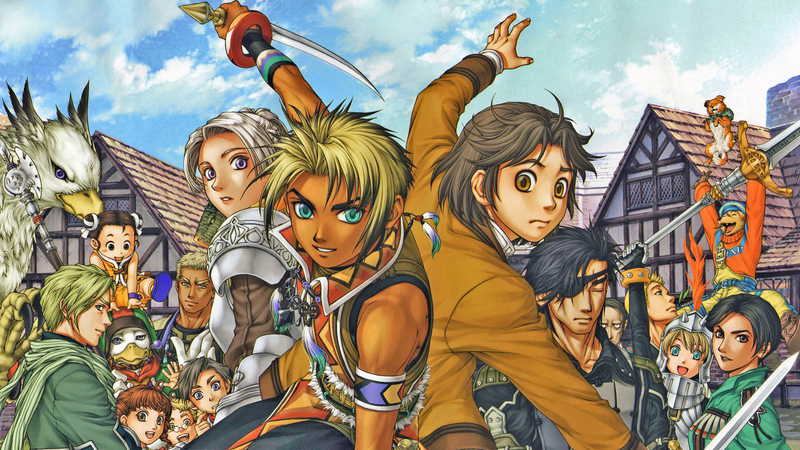 Suikoden III was also the swansong for series artist Ishikawa Fumi. Ishikawa was the artist from Suikoden II onwards, replacing Kawano Junko’s slightly more art nouveau style of work with a hard-lined, bright coloured look and more detailed costumes which captured more attention in the early 2000s. Although there is no indication of disastisfaction with her, she would be replaced by her predecessor, Kawano Junko, once a new producer for Suikoden IV was announced. That producer? Kawano Junko. Although the Trinity Sight System that was the core of the games narrative proved relatively uncontentious, some complained of the repetition of visiting previously seen locales with new characters at different points in the narrative. Some were more irked with the idea that enemies, enemies, were Stars of Destiny in this title, showing the growing conservatism that quickly grips the fanbase of any media type. This conservative element of the fanbase also dismayed of the series jump to 3D graphics over the beautiful sprite work of the first two games which lent the game a distinctive visual style. By choosing a slightly super deformed style over more realistic modelling, the game managed to maintain some semblance of a unique aesthetic while still maintaining clarity. The majority of fandom complaints however stemmed from the battle system, which featured six characters sorted into three groups of two. You would choose the commands for one character in each group, with the second character entering into a sort of AI-informed support role on each turn, based on the commands selected. As far as RPG battle systems go, it’s fairly unobtrusive and easy to get to grips with even if it’s question what, exactly, it’s supposed to bring to the game but as far as a vocal segment of fans were concerned this was the equivalent of Dirge of Cereberus: Final Fantasy VII. The linked battle system, combined with the potential to deal collateral damage with wide ranging spells, proved controversial with long term fans of the series. Suikoden III’s plot continued the themes of the original games, namely that of a local conflict where there are multiple points of view. The Trinity Sight System, however, allowed this to be explored with more than mere platitudes for the first time in the series. 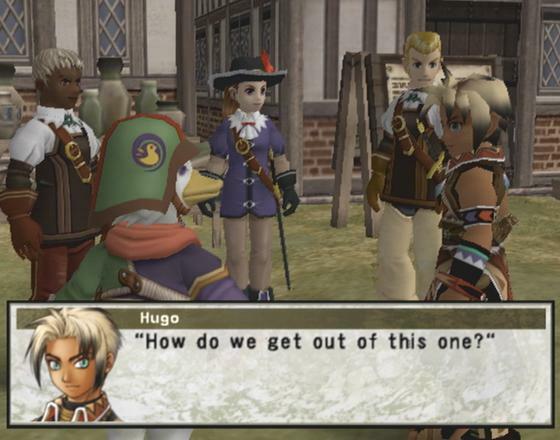 The ability to take on three different perspectives in the narrative, with the bonus of three other minor narratives for added detail, allowed Suikoden to process a more complicated and nuanced plot in a segmental manner, allowing layers to fall gradually and gaps to be filled in when dictated by the story and not the linear narrative of the first two games. Not that Suikoden III’s story should be considered high art. It embraces the noble savage stereotype so hard you expect Kevin Costner to play the lead role and many story and plot elements are either of their time (if you’re being generous) or near farcical (if you’re not). But what it does, it does well, providing a broad stroke look at issues of colonialism, cultural development and the disconnect between war and those who would run them. Combining that with the most developed cast of characters in any of the games and the added layer of the predestination concepts mentioned earlier results in a plot that secures depth through the sheer physical mass of its storyline if nothing else. In the end, Suikoden III was a game of incremental changes in gameplay, which angered a reactionary fanbase and plot nuances which met with wide approval. As a talisman for the series, it was largely a failure. It certainly failed to galvanise the series and fanbase in the same manner as Suikoden II. Looking back, many fans view it as a sort of last hurrah for the series, even as it stumbles on like a zombie with 2011’s Genso Suikoden Tsumugareshi Hyakunen no Toki not exactly setting the world on fire. At the time, many thought it might mark the beginning of the end. Perhaps, uniquely in this case, they’re both right. Although it is amusing to think that a title which deals so much with stagnation preceded what some see as the biggest run of intellectual stagnation in an RPG series to date. I am definitely one of those people who got tripped-up by the battle system, particularly the pairing aspect of it. It was nice for characters like Hugo and Fubar who had a rider-mount mechanic; decidedly less so for everyone else. I didn’t like the friendly fire danger at first, but I’ve come around on that. Most RPGs don’t have any risk/reward to their systems whatsoever. I’m hoping that in event of a new, proper Suikoden continuation, Trinity Sight makes a return. Mechanics which marry game design and storytelling shouldn’t just be left lost in the ether. It’s definitely a battle system which works fine once you get your hands on the reigns, but you wonder what it’s supposed to add. Presumably some level of tactical thought beyond the “X, X, X, X” or auto battles of the first two but it doesn’t really accomplish that if so. The Trinity Sight System was the best thing Suikoden ever did, in my opinion but it would fail without a certain type of plot to support it. Even other entries that most people enjoy, like Suikoden V, would need a huge amount of rewriting to become anywhere near workable under Trinity Sight. Regarding the Trinity Sight System, I do agree that it offered a very unique way to view the game’s storyline. However, on your point of it requiring a pecific type of plot to work, I think it is not so bad if you take into account the mechanic while making the game. After all, it is a game, not a novel or TV show. I am usually confounded by how little regard there seems to be for SIII in the Suikoden Community. To me, it represents the best of the series and will always have a special place that perhaps the other games won’t have. The amount of side characters that actually take a reasonably important place in the plot is larger, leading to the most developed set of Stars of Destiny in the whole series. And the themes of colonialism really did strike a nerve personally, having been born and raised in what is essentially a colony of the US. Overall, a good and easy read, though I wish you had put more in there about what new perspective this past decade has brought to your enjoyment (or not) of the game. I kinda wish I had a PS2 to go through that excercise myself. I havent really played Suikoden 3 because I was really bummed off that Suikoden 3 had 3d graphics, I think it would be better if they made the graphics of Suikoden 3-5 like the original Suikoden 1&2. I know it’s an opinion, but I have to agree with John in that the design team for Suikoden III actually did an excellent job at translating the art syle of previous games (or Suikoden II at least) into 3-D. I really feel like there’s few differences, except that the technology of the time or the game’s budget did not allow those custom animations that are probably orders of magnitude cheaper to to with 2-D sprites. I really recommend playing Suikoden III. It shows a progression from Suikoden II that we never really got to see again, what with the rest of the series being prequels or non-old continuity. It is quite the jump, but you’ll get used to it after a few hours I’m sure. The camera tends to be a bigger issue than the graphics, I think. I would love to see another 2D Suikoden in the main series. Sprites are still extremely viable even in today’s world of super flashy high-poly 3D stuff; just take a look at Vanillaware games like Muramasa (an HD port of that is coming to the Vita soon) and all the crazy stuff coming from the indie developers. I think a Suikoden game with big, hi-res HD sprites would be beautiful. Probably still more cost-effective than another 3D outing, too. Might never see retail, but I’m sure most fans wouldn’t complain if it turned up on PSN or XBLA in a digital-only format. That said, the idea of a huge, triple-A Suikoden VI funded by a proper budget for once is hard to argue against. This series, with all its big themes and heady subject matter, would be best served by an all-out treatment. Unfortunately, even Suikoden V required outsourcing to some degree from Hudson, so I figure the only way Konami would put that much money into it is if the whole franchise got a reboot. I hear tell that 2D games can actually be more expensive than their 3D counterparts, at least in the character design regard. With 3D you pay for the model design, then you use your engine to animate it whereas 2D basically has you paying for each sprite frame. Riou in Suikoden II has over 200 of them and if we’re talking hi-res HD sprites, then we’re talking about tripling that to make things look smooth because you’re not getting away with a three frame walk animation in HD. On my first play of Suikoden 3, I was disappointed with the art direction, baffled by the new battle system, angered at the grinding required, and absolutely furious with the limitations of the camera. Needless to say this was hardly a complete playthrough of the game. Well I was absolutely taken with Suikoden 1 from the first moments, and given a couple of playthroughs, Suikoden 2 became my all time favorite game. So I decided to retry S3 some time later, and, while still somewhat frustrated with the grinding involved at parts, the occasionally long traveling from one quickly-to-become boring place to another, and some of the battle mechanics, I managed to deal with the frustrations and get through to the very end. Decent game, is what I concluded (though I did not beat the final bosses; that would require greater patience). It was on my 3rd playthrough however, with some internet help as to battle/leveling mechanics, rune usage, etc. that I was mostly unaware of, coupled with a growing love of the series (following replays of Suikoden 1, 2, and a fresh 1st-try completion of Suikoden 5), that I found myself deeply buried in the game. I had acquired new appreciation for its plot, art direction and battle system/mechanics (yes, even there, though again, it required some outside help). Like Suikoden 2, some of it’s greatest charm comes from referencing the previous game, but unlike the first 2 games there was all of a sudden a battle system that required some strategy, including more intimate knowledge of individual characters, runes/spells, pairs, and leveling. While I only played a couple hours of S4(quitting due to the water travel) I believe S5 is a pretty close competitor to S3 in overall terms, but when it comes down to basics, S3 has much more of that fundamental Suikoden feel (and this includes subtle things like time involved in battle). Pretty good game. But absolutely no Suikoden 2, anyway- in my mind, the greatest video game ever made. As one of the few who’s finishing the game just now (but a long time Suikoden fan already), I agree that many aspects of the game are concepts you can only appreciate with some time..and with great comparison with Suikoden 4 and 5. I find the travel to be incredibly dull at time but with Viki and some practice, you get used to it. I ended up seeing more the battle system, fun camera angles and the animation on the runes. It could use some chopping down but at least it’s not as dull as the minimalist attempt in Suikoden 4. The skills and war battles are probably the best. The monster design is quite intimidating each battle can be quite a scare. The score besides the opening is pretty forgettable, unfortunately. 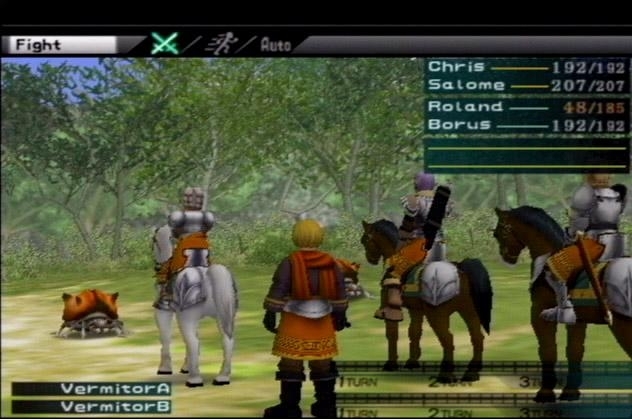 Suikoden 3 is vastly different from the others in terms of style and gameplay but it was still very much fun to play. I like the challenge it posed and really wished they kept the skill system and the theater. God, the theater.